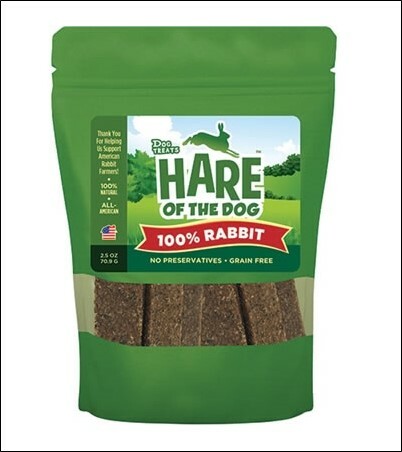 Hare of the Dog 100% Rabbit Jerky is great for dogs with allergies and, due to being easily digestible, it's also good for dogs with sensitive stomachs and gastrointestinal or pancreatic issues. Rabbit is higher in protein and lower in fat, calories and cholesterol than chicken, veal, turkey, beef, pork and lamb. 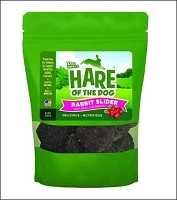 There is nothing but 100% rabbit in this jerky - no preservatives, artificial fillers or additives - only rabbit! NOTE: This jerky is a great chew. 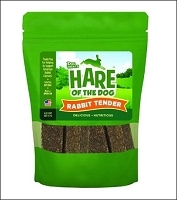 It's not as soft as the Rabbit Slider Treats nor the Rabbit Tender Treats made by Hare of the Dog.